Park near Windyhaugh in Upper Coquetdale (NT866109). Head back along the road and take the bridleway which goes to the left of Barrowburn farm and through a shallow ford. Keep with this track as it turns north north eastwards, eventually climbing steadily towards the edge of the Kidland Forest. Cross the ladder stile into the forest and follow the track down to the Usway Burn. Cross the footbridge on your right, pass behind Fairhaugh and follow the gravel track which climbs up through the forest. 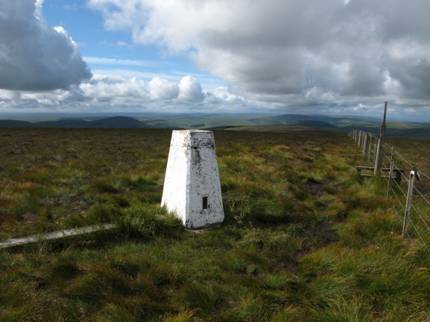 On reaching a cross track (Clennell Street), turn left and continue to the forest edge. Cross the stile and turn right for the climb to Yarnspath Law. Continue, with the fence on your right, off the top and eventually uphill to the summit of Blodybush Edge.